My dear friend DharmaApple wrote a great post about a project we are starting in January. She wrote it so well that I'm massively plagiarizing her - with her permission - here! So here goes...her post, slightly modified! 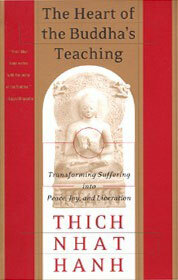 Starting January 1, 2013 my friend DharmaApple and I will begin a new dedicated practice period (Similar to our current Four Foundations practice) called "Buddha Heart - A Yearlong Dedicated Practice & Study Group" based upon Thich Nhat Hanh’s "The Heart of the Buddha’s Teachings" as the practice/study guideline. We have set up a Facebook page for participants to post guided meditations, talks, articles (etc.) related to whichever aspect of the book we are focused on. This will assist in understanding and deepening our practice together. There is a lot of value in learning from one another. In addition to the Facebook page, we would like to have monthly Skype discussions where we will have a guided meditation and discussions together. Unlike her wonderful book club (BuddhaBkClb) this is not just about reading and discussing a book. It’s about really making the effort and applying these practices into our daily life in an organized and systematic manner with support of virtual Sangha. If you ever find yourself confused over what tradition you are interested in or turned off by the dogma of some of them, or if you are just trying to get back to the basics, then this year of core practices might be perfect for you. We have many reasons that all sort of came together at once to generate this idea for us, but for me one of the main reasons is that the Three Gems, The Four Noble Truths and The Eightfold Path are the very core of my path. When I get distracted, or confused, or have doubt, these teachings always are there for me - rock solid, and dogma free. It is these basic teachings that Thich Nhat Hanh manages to share in both his lovely and simple way, yet with very organized and logical clarity. We hope you'll join in the fun!